LAS VEGAS, APRIL 16, 2012 — RTW, a leading manufacturer and distributor of professional audio metering and control devices for studio recording and radio and TV broadcast applications, is pleased to announce the recent installation of its TM7 TouchMonitor at the prestigious John Williams Scoring Stage at the University of California (USC) School of Cinematic Arts. 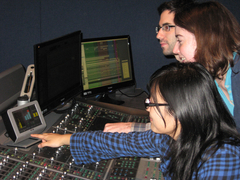 The 7-inch touch-sensitive audio monitor has become an integral part of the school’s undergraduate and graduate programs, specifically for students learning about film scoring, mixing and audio post production. The innovative touchscreen capability provides a more flexible, comfortable experience for the students, most of who are accustomed to using the same touch technology on their personal electronic devices. After spending some time with the TM7 at last year’s NAB Show, USC’s Chief Audio Engineer Buddy Halligan knew right away that it would be part of the school’s recent redesign of the John Williams Scoring Stage. Halligan, already familiar with RTW from the positive experience he’d had with the company’s SurroundMonitor 10800X PLUS—there are five units installed in the dub stages at the School of Cinematic Arts—purchased the TM7 soon after. The TouchMonitor’s LRA (Loudness Range) instrument, a descriptor specified in ITU-R BS.1770, which combines the two most critical loudness-metering parameters, is used extensively in USC School of Cinematic Arts’ graduate-level advanced sound, sound production and post-production film classes. In the sound production classes, for example, the students show their dailies, receive rough cuts, final cuts and then produce the final mix. The TM7’s LRA has proven to be an integral teaching tool as the students take their content through each stage of the filmmaking process. It is also used in the scoring classes in a similar way. Halligan also likes the customization and flexibility the TM7 provides. For the faculty, it is helpful to be able to set up different pre-sets in order to cover all required topics in class. Plus, since all of the readings can be viewed simultaneously and projected onto a larger screen, all of the students can have a clear visual of what they are listening for. The TM7 and TM9 TouchMonitor versions, featuring 7- and 9-inch touch-sensitive displays, respectively, provide unparalleled flexibility and modularity, combined with intuitive control. The software visualizes multiple sources simultaneously. It supports displaying the same signal on multiple instruments in parallel, each with dedicated defaults with both horizontal and vertical operation. The system visualizes up to 16 analog and/or digital sources at the same time. The TM9 is even capable of providing a view of up to 32 digital channels when the 3G SDI option is implemented.